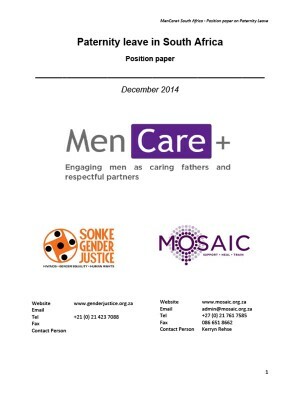 This position paper commissioned by MenCare+, recommends the introduction of a fully paid two week (10 day) paternity leave. This recommendation is informed by international evidence and an understanding of the South African demographic and socio-economic context. The introduction of paternity leave is supported by the White Paper for Families, and would require the inclusion of paternity leave in the Basic Conditions of Employment Act 75 of 1997. The formulation and oversight of a paternity leave provision would come under the auspices of the Department of Social Development, Department of Labour and the Department of Women, Children and People with Disabilities. Additionally provisions for the Unemployment Insurance Fund to provide funding for paternity leave would require amendments to the Unemployment Insurance Act 2001. This position paper aims to support the development of paternity leave legislation in South Africa, and to stimulate a broad national debate around work/family policies, by providing an overview of research and practice globally, and an analysis of the South African context.